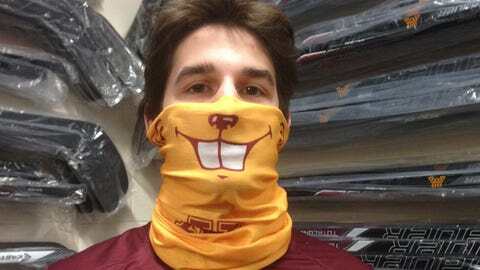 Minnesota defenseman Brady Skjei poses wearing one of the Goldy Gopher masks the university is giving to students who attend the Hockey City Classic at TCF Bank Stadium. MINNEAPOLIS — The temperatures might drop to the single digits for Friday’s outdoor game between Minnesota and Ohio State, but students will be able to stay warm in style. The Gophers announced Wednesday that they’ll be giving out Goldy Gopher masks to students attending the Hockey City Classic at TCF Bank Stadium. The gold masks feature gopher-style teeth and a nose, as well as the school’s "block M" logo. The university is anticipating between 45,000 to 50,000 fans at Friday’s game. Minnesota’s women’s team will host Minnesota State in the afternoon, and the Gophers men’s team will host Ohio State at 8 p.m. CT. It’s the second annual Hockey City Classic. Minnesota took part in the inaugural event last year at Soldier Field in Chicago. Forecasts for Minneapolis show highs around 12 degrees during the day, meaning players and fans alike will need to wear a few extra layers. By the time the puck drops for Minnesota’s game against the Buckeyes, those gold masks will certainly come in handy.